My kids absolutely love to be in the kitchen with me. They are thrilled to measure, stir, sprinkle, etc. And I enjoy the conversations, the teaching, the laughter and the wonderful memories being made. So for Christmas this year, my older boys (age 4) will each be receiving their own gourmet gift "basket" of cooking things. I went to an inexpensive superstore and found measuring cups, spoons, cutting boards, scrapers, whisks, and more. I ordered safe cutter knives from Pampered Chef - there is no way they can hurt themselves using them and they are $3 apiece. Finally, I ordered aprons and hats from Etsy - they are yet to arrive but for an embroidered apron, personalized hat, rolling pin, and hot pad it cost me $15/child. I also included a kid's cookbook which I found at a Half-Price books for $3 or less on clearance. You can mix and match whatever you like for your child to personalize it and to find the price point that works for you. I tried to choose colors that are the boys favorite and make it personal for them. All told, they probably cost around $30-35 with the apron being half of that but you could do it for much less. I think this type of gift would be perfect for children age 3 yrs. - 9 or 10 yrs. I'm putting a mix into each boys basket so that have the start of something for us to make together. Either mix would be perfect for a gourmet gift basket for an adult. Make a Breakfast Basket with Maple Syrup, Coffee, and Pancake Mix or a Snack Basket with Popcorn, a movie, and Cookie Mix! Don't forget to attach a tag with instructions on how to use the mix. Combine all dry ingredients and store in an airtight container. Combine but do not overbeat. Cook on a greased griddle until golden brown on each side. 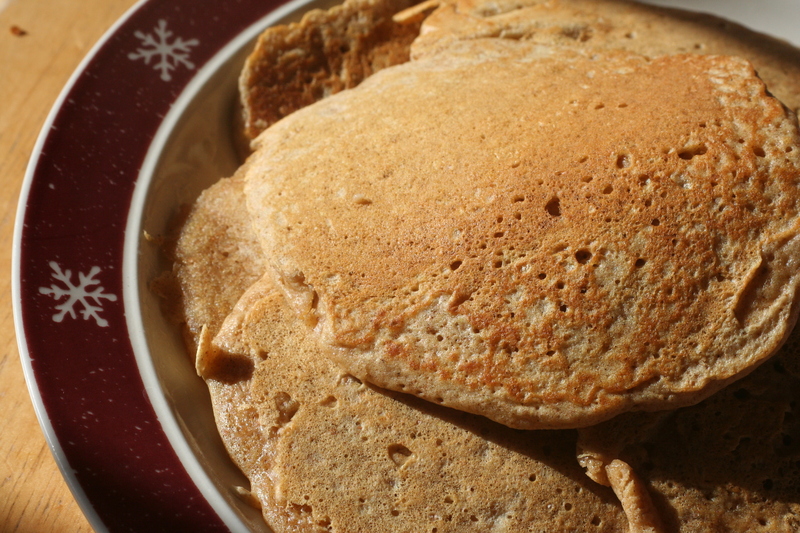 Serve with syrup, vanilla yogurt, or applesauce! Combine all ingredients and store in an airtight container or bag. Preheat the oven to 375 degrees. In a large bowl of an electric mixer, cream the butter, egg, and vanilla. Add the oatmeal cookie mix and stir until the mixture is well blended. Drop the cookies by rounded tablespoonfuls onto ungreased cookie sheets. Bake for 9-12 minutes. Cool 1 minute then remove to wire racks. Makes about 4 dozen. 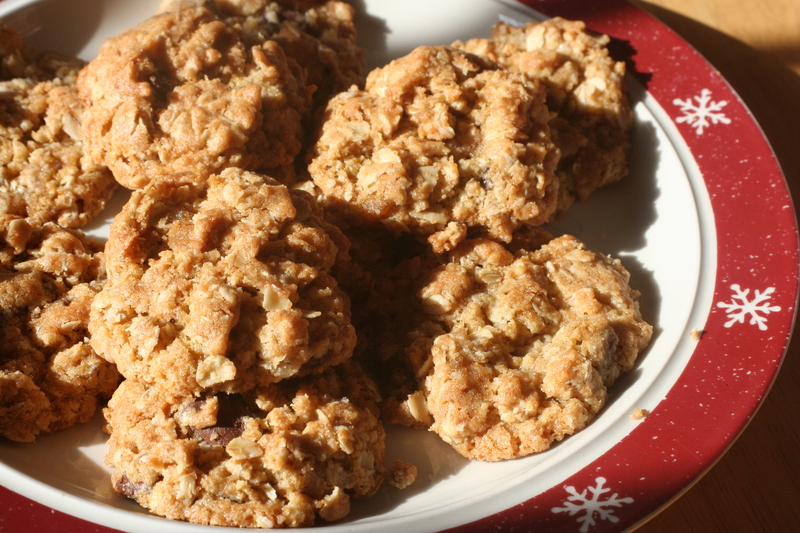 VARIATION: Instead of chocolate chips, mix in 1 c. of raisins or dried cranberries and 1 tsp. of cinnamon. So the giveaway today is a kid's cookbook! It would make the perfect gift for a child in your life (son, daughter, niece, nephew, sibling, friend...)! My children love looking at the pictures and helping decide what we will make. They take such pride in the things they have made themselves and getting your child involved is a great way to get picky eaters to try different foods. The cookbook today is Paula Deen's My First Cookbook. It has easy instructions, a variety of recipes, and is spiral bound. - Leave a comment telling us one thing you remember making with your parents, something you like to make with a child in your life OR your favorite food as a kid. - One entry per person and the giveaway will stay open through Tuesday. - That's it! I should have it in the mail in time for you to receive it by Christmas. I like making most things with ONE child, but since that is usually not the experience here at our house, I often feel a little overwhelmed! My kids like to help with just about anything. One of their favorite things to make is cinnamon-sugar biscuits. As a child I remember making a banana boat with my Mom. YOu slice open a banana lengthwise, fill it with marshmallows and chocolate chips then microwave it to melt the chocolate. Yum! The boys and I love to make and decorate cookies and brownies. My favorite memory growing up is making different christmas cookies with my mom and then going to friends homes and giving them out. I love making wedding cookies with my son Josh and No Bake cookies with Ethan. Each is their favorite cookies. I remember making angel food cake with my mom - especially the first time when she taught me how to separate the egg from its yolk. As a side note, did you see Megan McArdle's cooking utensils to ask for for Christmas? I'd love to see your take on what's helpful (and what's not) for the kitchen. 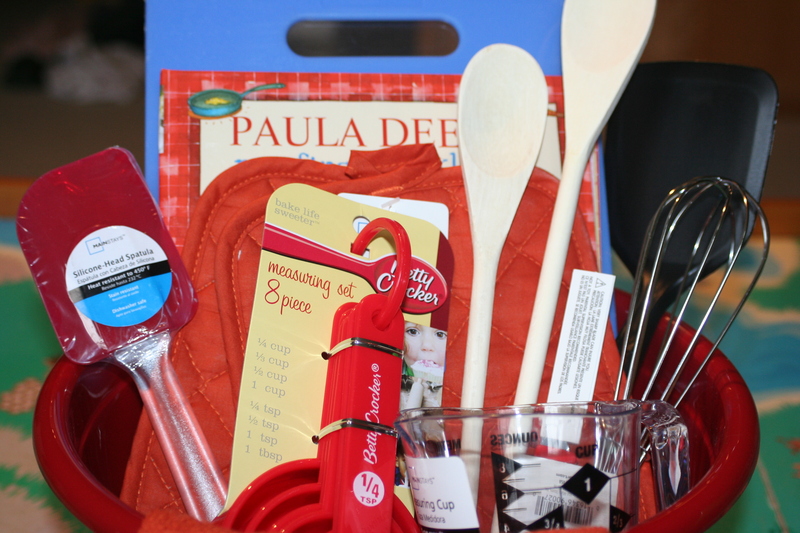 What a great gift idea with the personalized baskets! I'll have to remember that. The most fun thing I've made with my kids is tiny apple pies in little patty pans. They were SO proud of the results! I spent a lot of time in the kitchen with Mom when I was little; being the little helper and all. But the memories I try to hold dear and hope I never forget are the times I spent in the kitchen with my grandfather, her father. No specific thing that we made stands out. We'd bake muffins, make jerky, make Vietnamese spring rolls or just every day dinners while I was over there. I remember asking him what he just did or added and then would ask why. I was full of questions and he always was happy to answer them. Before he passed, I went back to visit him for Father's Day week ... and I made him Vietnamese spring rolls since he loved them so much. To this day, whenever I make them, I think of him. I remember spending lots of time in the kitchen with my mom. I was homeschooled, so she used that time to teach about fractions, nutrition, and other things that came up along the way. I always loved making chocolate cookies - licking the beater was the best! I can't wait to be able to actually do more in the kitchen with my little ones. My favorite thing to make in the kitchen with my boys is chocolate cookies and the best part of the process if of course to eat them when they are done!! My favourite thing by far was candy-cane cookies. I loved colouring half of the dough red, and then twisting that with the white part to make the candy canes. Also crushing the peppermint sticks was fun :) Most of all having Christmas music playing in the background, and getting flour all over me, and sneaking bits of dough when Mum wasn't looking!! I always loved making cookies with my mom and still do! Thanks for the chance. I like making homemade pizzas with my kids. I give them small pizza crusts with sauce on them. They add their own cheese, pepperoni, canadian bacon, olives and mushrooms. The one thing I love doing with the kids is when the first real snowstorm hits.... we are up making homemade dounuts!! Lots of fun and work. I loved reading though all of the comments here--what great ideas and memories. (I am DYING for some of those recipes!). My favorite theme for baking with kids isn't one thing particularly but rather a time--a snow day, an unplanned unstructured time when the kitchen is warm and inviting. My most recent thing to make with kids is CRANBERRY CREAM PUFFS! Here's a link to the recipe in case anyone would like it. Unfortunately, her brother has shown no interest in the kitchen other than checking the refrigerator for what others have made. 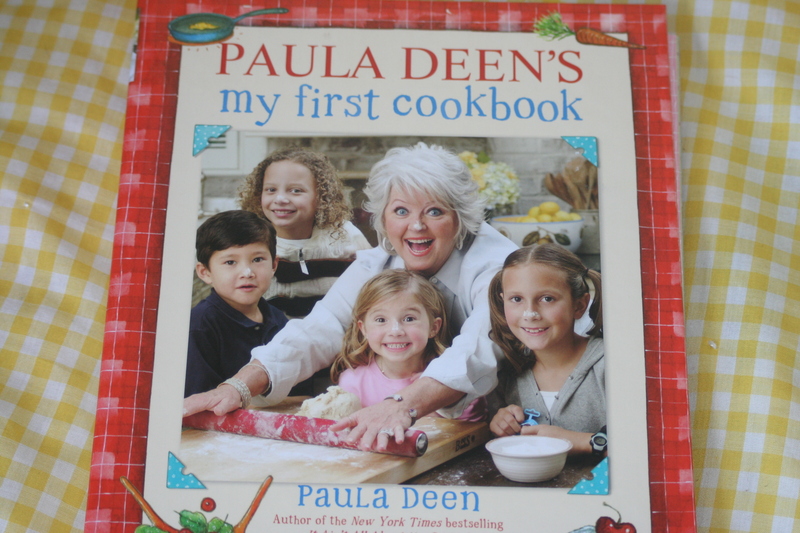 My granddaughter would LOVE the Paula Deen book. She is only seven but she already loves to spend a lot of time with her mother in the kitchen. My favorite thing on Christmas was mom's homemade cinnamon rolls. I have finally gotten the recipe down. YUM! My girls are also getting aprons and hats from etsy. Key2Life has the cutest sets. We got a matching apron for Phil's mom and myself! Love spending time in the kitchen with the girls! I used to love to decorate spritz cookies ith my mom and grandma. My mom got a kids cookbook for me when I turned six. She still has it. We still have a favorite family recipe or two out of that cookbook. It also gave her few headaches (Mom, can we put carrot curls on canned pears to make spiders?? How do you do that???) Maybe you guys know this stuff, but that was not up my mom's alley. Not from that cookbook, but a family tradition from growing up was decorating sugar cookies at Christmas time. I did it with mom as a kid, as I do it now with my kids. They love the sprinkled cookies (and with girls, we have 2 bottles of pink sprinkles, even for Christmas cookies! ), and choosing the cookie cutters to use.